Easter Island, also known as Rapa Nui and Isla de Pascua, is a long way from anywhere. Te Pitoote Hanua, which means "Navel of the World" is the most isolated inhabited island in the world, being about 2000 mi (3200 km) from Chile and Tahiti, and until the Mataveri International Airport was built in the 1960's, getting there was only by ship. That's how the island was "discovered" by the Dutch in 1772, when Admiral Jacob Roggeween landed there on Easter Sunday and gave the island its non-native name. He was the first European to describe the unusual statues carved from the volcanic rock from Rano Raraku. Standing as tall as 18 ft (5.5 m)and weighing many tons, the statues are known as moai, and each are representations of the same figure, perhaps a god or mythical creature, or an ancestor figure. This beautiful Tour of the Ruins will give you an idea of what Roggeween and his crew saw. The moais stood in a row along the coast, (see map) a few looking out to sea as sentinels or guardians of the people of Rapa Nui, but most facing inland, as if as if overseeing the activity of the island. There were many additional statues of varying sizes and stages of completion on the slopes of the volcano. The Admiral described cultivated land and woodlands as well as the moais you'll see in Easter Island in 3 Dimensions. He estimated the population at more than 10,000. When succeeding visits from English, Spanish and French expeditions visited the island in the late 18th century, they found a much smaller population, many moais toppled and very little land under cultivation. Whalers made the island a stop, and later slave traders captured 1000 natives and took them to work the Guano islands off the shore of Peru in 1862. Of the 100 who survived, 15 came back to Rapa Nui with smallpox. The census count of 1881 listed less than 200 people. Chile annexed the island in 1888 during a period of expansion following the War of the Pacific which took away Bolivia's access to the Pacific. Until the 1950's the Compañia Exploradora de la Isla de Pascua (CEDIP)) was the de facto governing body, as the arm of an Anglo-Chilean enterprise. The Chilean government revoked CEDIP's lease and the Chilean navy administered the island. With improvements to the basic quality of life, living on Rapa Nui became easier. Today, with air travel, supplies and greater interest around the world, Easter Island's population is growing. They all live in the only town of Hanga Roa. Rapa Nui has been declared a World Heritage site by Unesco. There are regular flights from Santiago and tourists, scientists and the curiosity seekers come to examine the moais, learn about the island's past and ponder the lessons it has for the future. There are many mysteries to Easter Island. For a small island, about 64 sq mi (166.4 sq km) there is much to be discovered and interpreted. One of the easier mysteries, if more chilling, is the mystery of the missing population between the visits of Admiral Jacob Roggeween and Captain Cook in 1774. The accepted explanation is that the islanders had outgrown their resources: agriculture couldn't feed the growing population. They cut down the trees, and without the means to build canoes and leave the island, they eventually resorted to war and cannibalism. The moais were pulled down as first one faction then the other destroyed their statues. Many theorists see what happened on Easter Island, label it as Rapa Nui Syndrome, and see it as a warning to the rest of Earth's population. The abiding mystery are the Moai statues of Rapa Nui. What are they? Why are they? Who are they? One prevailing theory is that each of moai is a representation of the god and ancestor, and as in other Polynesian religions, gave power, or mana, to the people who erected and maintained the statue. If, as theorized, each of the family or clans on the island, had their own moais, building a platform called an ahu to serve as a family burial vault, then it is easy to understand why warring clans would want to destroy the source of each other's power. This theory doesn't explain the placement of the moais, nor why some look so different than the ones with prevalent long ears, thin lips and unsmiling expressions. Traditionally, the warring factions have been identified as Short Ears and Long Ears, which may explain the greater number of long-eared statues. Then there is the mystery of the missing eyes. Were the eye sockets carved out and left empty until the moai was erected and the mana supposed to begin working, or were the eyes, made of coral and scoria inserted only on ceremonial occasions? Thor Heyerdahl expostulated that the settlers of Rapa Nui came by balsa raft from South America. His book Kon-Tiki created a wave of interest and permission to excavate and examine some of the moais. Theorists since then have either supported his work, as in Linguistic Evidence of Early Peruvian-Rapanui Contacts or refuted entirely the idea that humans had anything to do with the moais. In The Space Gods Revealed, Erik Von Daniken put forth the theory that bored space aliens created the statues. Neither theory is substantiated by the archaeological evidence although perhaps the NOVA team who attempted to erect a statue using only the tools a native inhabitant would have, might have welcomed some outside help. Read their story in Secrets of Easter Island. All the moais now standing were re-erected over the last decades. As the moais were toppled or abandoned, and no new ones created, the culture shifted to what is now called the cult of the BirdMan. This was still in existence, and documented in the 1860's and more than 150 carvings or petroglyphs exist in the rocks around the ruins of the village of Orongo, near the caldera of Rano Kau. The carvings depict a man's body with a bird's head, sometimes holding an egg in one hand, and the theory exists that this cult demonstrates the desire to escape the island. The basic ceremony of this cult was the task to find the first egg laid each spring on an offshore island by Manu Tara, a sacred bird. Each clan chief sent one candidate, or hopu, to swim to Moto Nui, the largest island below Orongo, there to wait for the eggs to be laid. When the hopu found an egg, he strapped it to his forehead and then made the dangerous swim back, climbed the cliffs and presented the unbroken egg to his chief. This chief would become BirdMan for the coming year, with powers and privileges. Some of the petroglyphs have fertility symbols mixed in. At the other end of the island is an area thought to be a solar observatory, or an astronomy tower. The Rapa Nui had a form of writing called rongorongo which no one could decipher. The meaning and source of these enigmatic characters has been open to interpretation for years, since a tablet was sent to Tepano Jaussen, Bishop of Tahiti, as a token of respect, by newly converted islanders. You will probably go to Easter Island by air. LAN Chile is the only airline flying there but you may make thrice weekly connections from Santiago or twice weekly from Papeete, Tahiti. The flight from Santiago is almost six hours long, but returning, due to prevailing winds, is less than five hours. Mataveri International Airport outside Hanga Roa has the longest landing strip of all Chilean airfields and serves as an emergency landing strip for space shuttles. Check flights from your area to Santiago or other locations in Chile. You can also browse for hotels and car rentals. The temperature rarely exceeds 85 (30ºC) degrees and does not drop below 57 degrees (14ºC). Be prepared for wind, which keeps the temperature comfortable, and for a light rain several times a day. May is the rainiest month, but the porous volcanic soil drains quickly. Bring comfortable clothes, good walking shoes or boots, a sweater or sweatshirt and a windbreaker. The most expensive months are during the summer season of December to March. Check today's weather on Rapa Nui. Depending on how long your stay is, and it really wouldn't be worthwhile to travel all that way and not spend four or five days there, you can plan to see the entire island by foot, 4X4, horse or motor bike. If on a bike or on foot, remember to take plenty of water, sunscreen, a hat and sunglasses. Take also a snack since there are not stores outside Hanga Roa. The roads and tracks are rough, but there's not much traffic and you'll be safe. The islanders like to say the only thing occupying the jail are the spiderwebs. 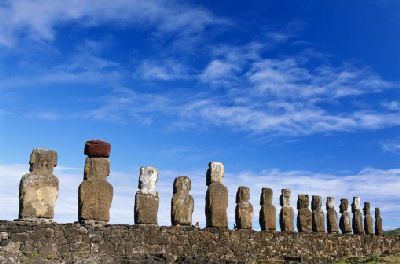 You can plan a drive by, with stops at some of the more famous moai, or a detailed study of each, and include a stop at the quarry site to ponder the half-buried and incomplete statues there. Visit Ahu Akivi, Ahu Nau Nau, Ahu Tahai and Rano Raraku. There are fees to enter the Ceremonial Village of Orongo and Ahu Tahai. You won't get lost. 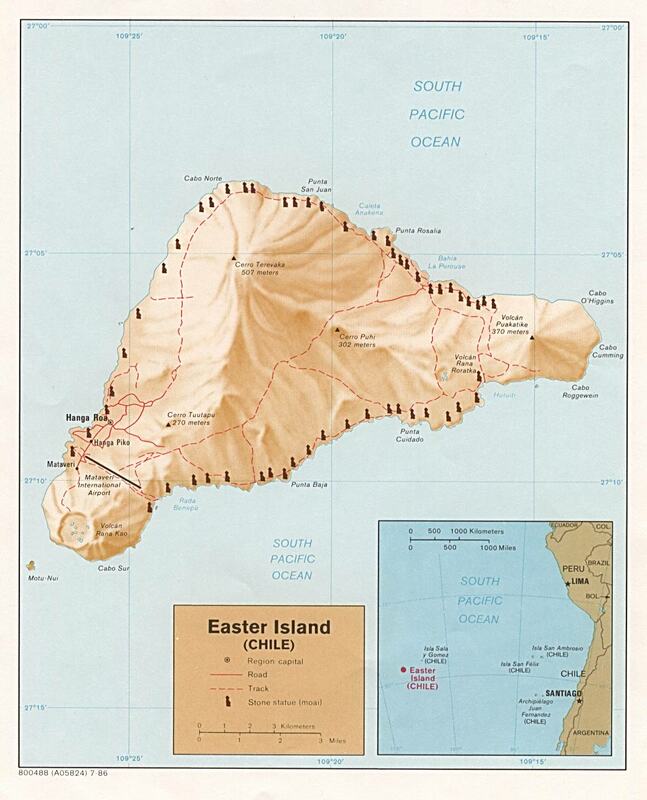 Easter Island is roughly triangular, with a volcano anchoring each corner. Maunga Pukatikei at 1200 ft (400 m) occupies the northeast corner, Rano Kau at 1353 ft (410 m) the southeast corner, and the highest peak, Maunga Terevaka at 2151.6 ft (652 m) presides over the northwest corner. The slopes are barren, and you'll get your exercise climbing up and down gentle hills. To date, there are no off-limits area, but do respect the archaeological work, the fact that a third of the island is the Parque Nacional Rapa Nui. You will not be allowed to remove any artifacts. You can buy replicas of moais, rongorongo tablets and other local artifacts in the markets. There are several hotels on the island, numerous guest houses, and you may camp at Anakena on the north coast, but all water and food must be carried in. Concult these additional hotels for for availability, rates, amenities, location, activities and other specific information. Some families will permit you to camp on their grounds. If you are traveling with a tour, your housing needs will be reserved, otherwise you can take your chances and make your own arrangements on arrival. Many householders meet incoming planes and you can make your selection then. Since everything is imported, be prepared for higher food costs. It may be less expensive to buy your breakfast and lunch needs from a local store, (there are two supermercados now) and dine in a restaurant for your evening meal. The lobster is delicious. There is a choice of Shops and Restaurants. As the island's economy revolves increasingly around tourism, discontent with Chilean ownership grows. There is a movement underway for self-determination and autonomy. Spanish and the local language are spoken, and local festivals such as Rapa Nui Tapati Fiesta, held every February, cememt Rapa Nui solidarity. Some groups, like the Consejo de Ancianos, wants the national park returned to the original inhabitants, who own no property outside Hanga Roa. Rapa Nui News will keep you informed. Other organizations, like the Rapa Nui Outrigger Club teaches skills, history and an appreciation of their culture to young islanders in addition to competing in outrigger canoe racing. You'll find Rapa Nui a pleasant, hospitable place to visit, but don't be surprised if you experience a sense of the mysterious, a sadness and the pull of the ancient moais. What Islands Make Up Costa Rica? Discover Chapada Diamantina National Park: Brazil's "Lost World"